Need to empty a washer full of water? If you are going to be moving, your washer is broken, or you are going to be performing any maintenance? At certain times you will need to manually drain the water out of your washer. 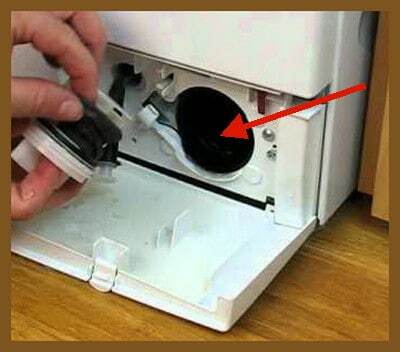 If a part is broken and the washer is stuck in a cycle, to fix the washer you will need to get the water out. If you have some water in the washer and you need to move it, then manual drain is needed. If you have problems with your washer not draining, click to find out how to fix it. You will need a large empty bucket, some old towels, and possibly some gloves to protect your hands. First start by unplugging the washer from the power outlet. If your washer is hard wired, flip the breaker off. If the washer has a large amount of water in it, get your empty bucket and begin to scoop out the water and pour it in the kitchen sink. Once you have removed as much water from your washer as possible, continue to next step. Slide your washer out from the wall or wherever it is positioned to get behind it. Be careful not to slide it out too far, as you could pull out the drain hose or the water hoses. Lay out a few old towels to protect yourself from dirt and gunk and also to catch any water that may leak on the floor. To get the water out from the very bottom of your washer, disconnect the drain hose from the wall. Position the drain hose as low as possible and into a floor drain if possible to empty the water. Note: Your washer may contain from 5 to 10 gallons of water. If you do not have a floor drain, let the water drain out of the drain hose and into your empty bucket. 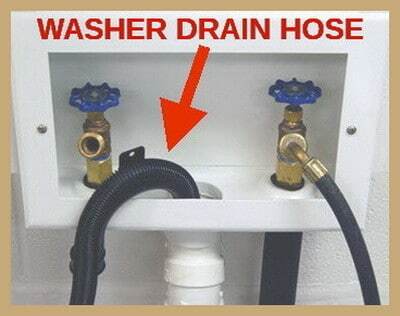 Continue holding the washer drain hose over the drain or bucket until completely empty. Once empty you can continue with your maintenance or move the washer as needed. Note: If you have a front loading washer, you can drain most of the water out from the very front by removing the drain filter. (See image below) Put your empty bucket (or dish since the clearance is low) underneath the drain filter, unscrew the filter and let water drain out. When your bucket or dish is full of water, twist the filter back into place to stop the water from draining. Empty your bucket and repeat until the washer is empty. If needed, follow the above instructions to remove any more water in your front loader before removing or doing repairs. 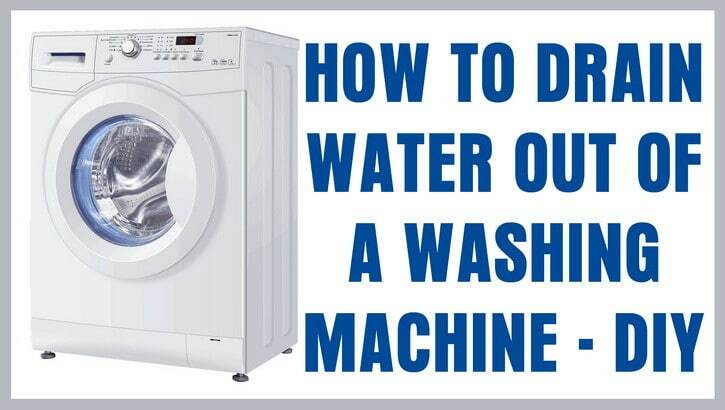 If you have other methods to empty a washing machine full of water, please leave a comment below to assist others. Ok. I’ve done this. There is no longer any water coming out of the hose. But, there is still water in the very bottom of the tub. I can’t see it. But. I can hear sloshing when i move the tub. Plus, it’s enough water to prevent washer from spinning. But, the pump gets most of the water out. So, why would there be water in the tub? How do you lift a front load washing machine into a drain pan that’s in a corner? There isn’t enough room to have two people lift at a 90-degree angle. In addition, we have rubber anti-vibration pads for the bottom of the washer, and they will NOT slide once it’s in the drain pan. The plug goes through the top of the drain pain by almost two inches, so we can’t put the washer into the drain pan and slide it over. We have scoured the net and can’t find anything to help. We are concerned about crushing the drain pan. My husband read the above recommendations on how to drain your top load washing machine. He went to the garage and got his wet/dry shop vac and drained the water from the washer. My washer is full of water. How low do I have to put the drain hose to get all the water out of my top load washer? We are moving and there is a little bit of water left in the bottom, gotta move it. Thanks. As low as possible. If you have a drain in the floor, let the drain hose down to floor level to get out all water. If you have no floor drain, use a bucket and turn it sideways to get the hose as low as possible. This will help you get out all the water so you can move your washer.